After a series of interesting videos about the game’s background story, the developers with THQ released a Metro Last Light gameplay video, which explained the basics of stealth. Huw Beynon, publisher’s community manager, told about the interesting properties and characteristics of weapons, new locations and the methods of their passing in details. The Metro Last Light release date is coming closer and the pre-order is now available for PC, Xbox360 and PS3 versions. And that's not all! 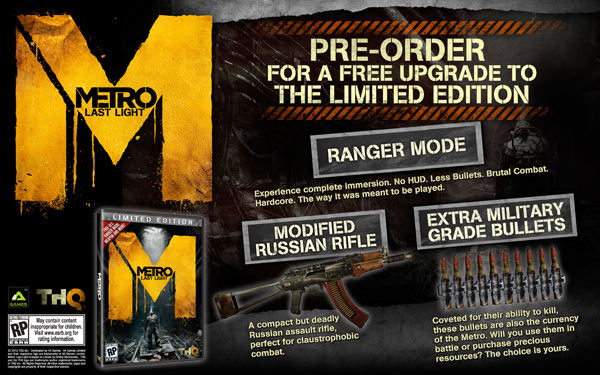 4A Games announced a unique content - "Ranger Mode" for Limited Edition owners, as well as HD Metro Last Light wallpapers, and a free copy of Homefront for PS3.